Kong Mas, CNRP official in Svay Rieng province, was arrested Jan. 16, 2019, in Phnom Penh for criticizing Cambodian government. Kong Mas, 33, was one of the leading members in Svay Rieng province of the now-dissolved opposition Cambodia National Rescue Party. His arrest is the latest in a series related to Facebook posts that the Cambodian government said were intended “to insult and/or incitement,” a charge often used to imprison government critics. It carries a prison sentence of six months to two years. Sam Sokha, who threw a shoe at a billboard depicting Cambodian Prime Minister Hun Sen, stands in police station in Phnom Penh, Cambodia, Feb. 8, 2017. In February 2018, Sam Sokha was arrested after a video surfaced on Facebook that showed her throwing a shoe at a roadside billboard depicting Hun Sen and National Assembly President Heng Samrin. 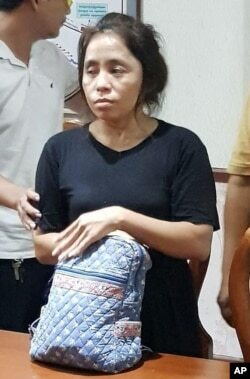 She could be heard saying, “These are the men who are destroying our nation.” She fled to Thailand requesting political asylum and was arrested for insulting Hun Sen’s ruling Cambodian People’s Party when she returned to Cambodia. 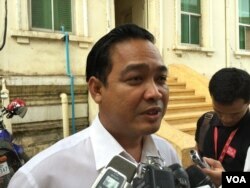 Sam Sokong, the lawyer for Kong Mas, said his client’s arrest was “completely politically motivated” because the evidence consists of posts from April to December 2018 criticizing the government, supporting the campaign to not vote in the 2018 election, and calling for Sam Rainsy, an opposition leader, to return to Cambodia. “When authorities or the government are angry, they will file complaints and 100 percent of the time, the court has to take action in accordance with the complaints, whether or not they’re based on the law,” said Sam Sokong, who has represented five people arrested for their Facebook posts. 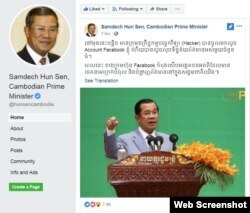 Prime Minister Hun Sen announced his Facebook account was hacked by local hackers, Feb. 25, 2019. ​Hun Sen is no slouch on Facebook. On his page, Samdech Hun Sen, Cambodian Prime Minister, the onetime Khmer Rouge commander posts photographs of himself posing with garment workers and students, and gushes about his love for his wife. If this makes the man who became prime minister in 1985 seem more approachable to Cambodia’s young and increasingly tech-savvy population, 40 percent of whom are avid Facebook users, that’s the point. Among those Facebook users are community activists and opposition supporters who are increasingly subject to the same pressures as their counterparts in the traditional media, according to “Going Offline? The Threat to Cambodia’s Newfound Internet Freedoms,” a report released by the Cambodian rights group, Licadho in May 2015. “I don’t believe the authorities do not understand what freedom of expression means, but we know it depends on their interpretation,” said Am Sam Ath, Licadho’s monitoring manager. United Nations Special Rapporteur on Human Rights in Cambodia Rhona Smith speaks during a news conference in Phnom Penh, Cambodia, Nov. 8, 2018. “I am reminded that freedom of expression and the controls that can be legitimately placed thereon are the same irrespective of whether the comments are made on Facebook, through other social media, or in printed media,” she said. “I have previously expressed concern at various provisions of the criminal code being used to limit freedom of expression in Cambodia,” she added.